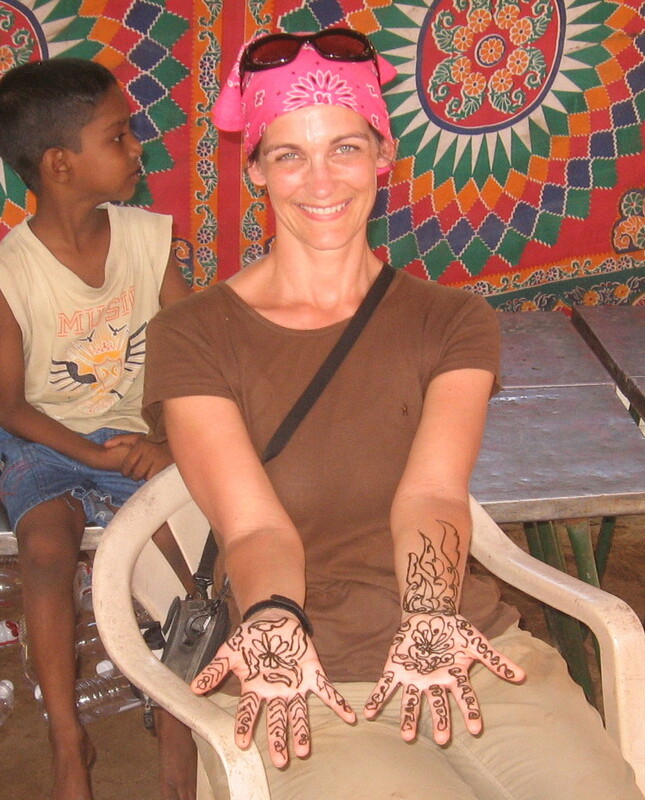 Volunteering in India.............. one brick at a time: Day 7: More Building...Plus Some Fun!!! We arrived at the village by 9:15am and as we drove up I could hear one of the little girls faintly in the distance saying...."Lisa, Good Morning"....how sweet is that...gave me goosebumps!! Today I was back at the second house we started...this is where the holes we dug filled in because of the rain. So it was no surprise to hear we had to "clean out" the holes so we could put in the concrete base. This work went quite fast actually...the dirt was not as packed down as when we first dug the holes. We had some nice little friends in our holes this time...lots of little and some big frogs...god they a quick. We also had a watch dog hanging around...there are lots of dogs running around everywhere in India. over the top. Today the homeowner's mother and her son were helping us. She is so cute...always wanting to help out however she can. She is pretty good a carrying bricks on her head too!!! Everyone seems a bit tired today...I am finally feeling well, so I have lots of energy...so lunch was a bit quiet. It's hard to believe today is our second last day on the build...how time flies when you are enjoying yourself. After lunch we spent about 45 minutes moving bricks from the road to the edge of where the foundation will be poured....I think we are becoming experts at moving/staking bricks!!! At 3pm, we finished early, as we were having a cooking demonstration. 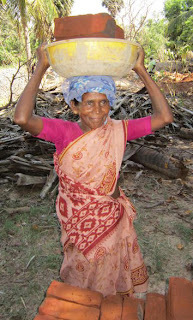 One of the women from REAL showed us how to make Dosa and chapati... Indian bread. It felt a bit like making peanut butter balls and then rolling pastry dough. When she cooked the bread she didn't put oil under the dough, but around it instead. Some of us tried our hand at the cooking...Siva should really have his own cooking show...while others took lots of picture. Good fun really. 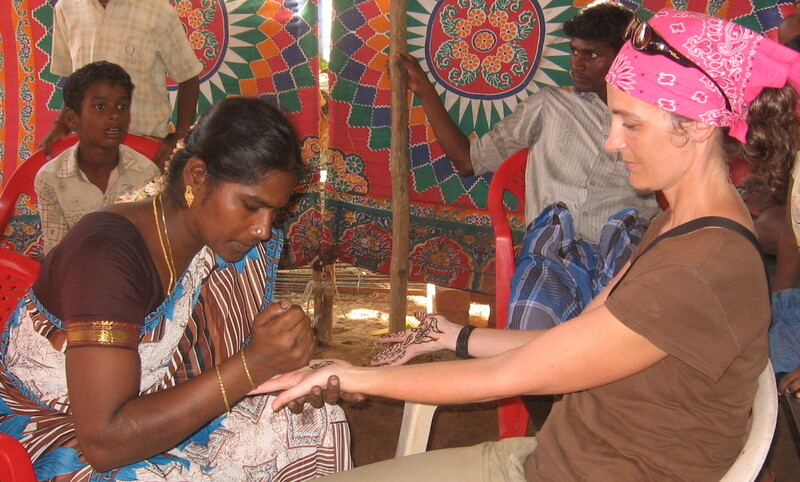 Once we finished cooking we then had many of the women from the village arrive to do some henna. Almost all the women on the team had henna done on the palms of their hands and up their arms. It is very interesting to watch them create these intricate designs. When we were all finished we showed some the villagers the final product...there were lots of people around watching, curious to see what we had done. They were very excited to see us having this done...even some of the men would bobbed their heads in approval...head bobbing in India is something you must get used to...a bit confusing at first. Henna takes about an hour to dry so none of us could carry anything...I think we had 5-star treatment on the way home, with people catering to our every need!! I even had to have someone put my sunglasses on for me...not so great when you have an itchy nose however!!! By the time we arrived back at the hotel, the henna had dried and it was ready to be removed....it really is a different colour when you wash it. It should stay on for about 2 weeks. Tonight we had dinner at CKS...sort of reminded me of KFC really. After that I headed out for some last minute shopping...hard to find any time to shop because we have such jam packed days. Found some great deals before the shops closed at 10pm and Lisa and I headed back to the hotel happy with our purchases. Another full day...looking forward to tomorrow.